Vancouver, BC – An exclusive new video published to YouTube on January 28, 2016, purports to reveal how sleep talking-like mirror-encrypted messages in NASA’s communications link between ground control and seven crew members of the Space Shuttle Challenger anticipated both death and search and recovery operations prior to what has been described as the disintegration of the vehicle’s launch assembly 30 years ago today. Mission STS-51-L Flight Director Jay Greene along with Data Processing Systems Engineer A. F. Algate, Flight Dynamics Officer Brian Perry and Ground Control Engineer N. R. Talbott are named in the video as sources of the involuntary disclosures. CBS News reported earlier in their coverage of the anniversary of this historic event how the mother of astronaut Christa McAuliffe wept openly during the launch before any sign of danger in what reporter Lesley Stahl termed a “premonition” of her daughter’s passing. It was CBS Television who would later audit the analytic procedure used to detect what had remained secret Challenger premonitions undiscovered until the publication of today’s new video. In multiple closed-door on-camera sessions, journalists and investigative reporters from Cleveland, Ohio’s 19 Action News attempted to discern the mechanism by which this reporter was shown to reveal the secrets of on-air staff and local newsmakers prior to running a story that would garner the station a number one position in the Nielsen sweeps for November, 2006. A sober reading by the anchor who introduced that segment on-air spoke volumes to the lasting impression and respect felt throughout the station for what became one of the great moments in local television news for that season. Premonitions of death and disaster populate literature of ancient cultures including Ovid’s “Metamorphoses” and the “Mahabharata” (Skr. “Great India”) of Veda Vyasa. Such portrayals resound with faculties of mind transcendent of time possessing extensive knowledge of the past, present and future intrinsic to human experience of the everyday and the extraordinary. The “Bhagavad Gita” contained within the Mahabharata offers possibly the world’s oldest Remote Viewing transcript as the entire text is composed of a narrative uttered by the seer Sanjaya concerning events taking place on a distant battlefield. The presence of previously undiscovered forensic information concerning secret premonitions in NASA’s ground control communications feed was detected while monitoring mirror-filtered renderings of the ground crew statements. The NASA video soundtrack from the space agency’s commemorative resource tape was loaded in the edit bay of a digital audio workstation then subjected to mirror-filtering and time-expansion in preparation for a detailed auditory study. The conduct of this procedure was informed by best practices refined through repeatedly providing military, forensic and medical-grade intelligence that had been successfully vetted through practical real-world feedback over nearly 20 years of unmatched research and reporting. NewsInsideOut.com has previously reported how the same procedure publicly revealed details of the Iraq War, identified the BTK Killer, named Russian spy Anna Chapman’s accomplice and uncovered the UFOs and ETs in Edward Snowden’s NSA cache weeks, months and years before such information became widely-accepted public knowledge. Below is a partial transcript of NASA ground control’s statements from January 28 1986, preceded by the pre-incident and post-incident secret messages encrypted backwards therein. President Reagan in his address to the nation concerning these events affirmed how “The future doesn’t belong to the faint-hearted. It belongs to the brave.” Website Spaceflight Now offers their version of a NASA Challenger incident timeline along with a complete transcript of voice communications conducted that morning’s events. Meanwhile in the blogosphere, the astronauts never died but instead lived on to resume normal lives. Vancouver, BC – January 23, 2016, marks the official release of “The Chakras and Kundalinii with Dada Vedaprajinananda” on NewsInsideOut Plus. At just under two hours, this video presentation provides post-graduate-level insight including lucid articulations of the tantric chakra seed sounds and clear descriptions of their accompanying Vrttis (Skr: “Emotions”). Filled with music and fun, the title teaches and entertains in a way that could only be informed by decades of personal practice and instructional leadership given in more than thirty countries throughout the world. Expert instructor Dada Vedaprajinananda recently sat down in an exclusive interview with NewsInsideOut during his tour of the British Columbia Sunshine Coast to discuss his book “From Brooklyn to Benares and Back”. Readers who watch the interview can meet the teacher to freely preview this yogic monk’s perspective on a variety of topics related to spirituality and social service. Access to the video stream for “The Chakras and Kundalinii with Dada Vedaprajinananda” is also available via rental or purchase. A significant part of these proceeds goes towards continued support of the instructor’s ongoing educational mission. Under the rental agreement, viewers have 30 days to view the title and 72 hours to complete viewing once streaming begins. NewsInsideOut Plus subscribers receive streaming access to new productions included each month with their subscriptions. Find out more about expert meditation instructor Dada Vedaprajinananda’s special insights into the articulation of Sanskrit mantras for meditation and yoga postures for wellness. Subscribers receive front-row access to “The Chakras and Kundalinii with Dada Vedaprajinananda” as presented in Roberts Creek, British Columbia this January. Want more “Inside-Out” news? Subscribe to NewsInsideOut Plus! NewsInsideOut Plus is for readers who support our journalism and want to deepen their connection with “Inside-Out” reporting. For $7 per month or $70 per year, a richer NewsInsideOut experience awaits. Receive exclusive access to mini-documentaries like “Marfa Reflections” and “UFO Canyon,” behind-the-scenes interviews like “UFOs and Spirituality” plus more. With your subscription you will be able to unlock the latest NewsInsideOut Plus content. Subscribe early to ensure you don’t miss any of the excitement. Click here to subscribe to NewsInsideOut Plus and receive new exclusive content each month. Roberts Creek, BC – In an exclusive new interview published to YouTube on January 22, 2016, NewsInsideOut met with yoga and meditation expert author Dada Vedaprajinananda during his tour of the British Columbia Sunshine Coast to discuss his spiritual memoir “From Brooklyn to Benares and Back.” From life in post-World War II New York, through the birth of Rock and Roll and the Vietnam-era draft readers discover compelling social and spiritual forces that culminated in the author’s pursuit of Self-knowledge leading to personal contact with one of the most profound intellectual and spiritual personalities of the twentieth century. In his summary Futures Studies researcher and Professor Sohail Inayatullah explained how this book teaches “equanimity of mind” offering a “journey in authenticity, in humanity.” Told with characteristic humor and insight, the monk’s tale offers his clear, no-nonsense take on a life extraordinary in pursuit of the yogic goal of merger with Cosmic Consciousness. The title is accessible to beginners and of special value to meditation students, yoga teachers-in-training and spiritual aspirants of all faiths. Seeming chance encounters with legendary musicians, Presidential family members and heroes of the Space Race populate the pages of this work. However, the most significant impressions are conveyed during his meetings with yogic Acharya’s (Skr: “Teacher by example”) who provide personal instruction in original spiritual practices of humanity’s ancient Sanskrit-speaking ancestors. These techniques emphasize unlocking the gates of consciousness through the recitation of personal mantras formulated to meet the needs of each individual’s character and emotional disposition. 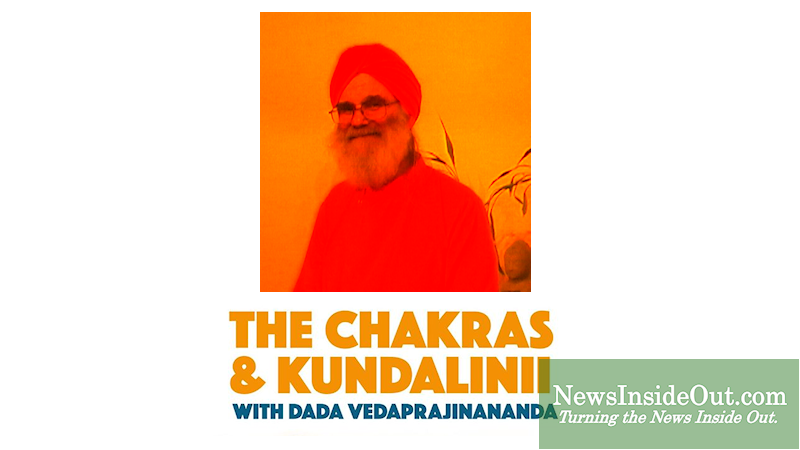 The nature of these instructions and their accompanying lifestyle are further elucidated in “The Chakras and Kundalinii with Dada Vedaprajinananda,” a presentation given by the author in January of this year now streaming on NewsInsideOut Plus and available for rental or purchase. At just under two hours, this talk provides post-graduate-level insight including lucid articulations of the tantric chakra seed sounds and clear descriptions of their accompanying Vrttis (Skr: “Emotions”). Filled with music and fun, this title teaches and entertains in a way that could only be informed by decades of personal practice and instructional leadership given in more than thirty countries throughout the world. For readers who wish to understand the secrets of spiritual living told in the voice of an expert western practitioner and experiencer, this reporter highly recommends “From Brooklyn to Benares and Back” by Dada Vedaprajinananda, now available through his website or on Amazon.com. According to his biography, Dada is a monk, meditation and yoga teacher and a singer-songwriter. A native New Yorker, he has lectured, performed and taught in more than thirty countries since the early 1970s. He currently resides in the Ananda Liina Spiritual Community in Urbana, Illinois, where he offers regular instruction and retreats emphasizing men’s spirituality and personal development. From DadaVeda.com: “This is Dada’s memoir. It chronicles his life, from his upbringing in New York right up to the present time. It give an inside glimpse showing how he was attracted to the spiritual path and how he went on to become a world-traveled monk , singer-songwriter and author. text is not like that. His words are even keel, just like the author. They live and teach equanimity of mind. Vancouver, BC – Exclusive new video published to YouTube on January 19, 2016, shows UFO images from a smartphone depicting two white luminous spheres over downtown Vancouver under blue sky daylight conditions on New Year’s Day. The witness claims there were three objects that appeared to be travelling southwest and that one of the objects, not shown in the video, had already disappeared behind a building at the time of recording. The remaining two objects seem to remain equidistant apart while drifting in slow unison unlike local seagulls or possible balloons. The raw original video was recorded in high definition 1080 resolution at 30 fps using a Samsung Galaxy Grand Prime SM-G530W smartphone CMOS camera. The published version corrects for vertical recording via digital magnification, image stabilization and time expansion providing viewers with a clear look at a mystery that accompanies daily life on the West Coast for numerous experiencers.